I was right in the middle of a dream where I was Lara Croft, but not as girlie, when my cell phone rang. I sprang out of bed, grabbed my nine, and hit the floor in a firing stance, facing the bedroom door. Then I remembered I was hiding out in Sinful, Louisiana, and not on a CIA mission in the Middle East. I lay my nine back on the nightstand and reached for my cell phone. I looked down at the display and saw it was Gertie, one of the seemingly quiet and unassuming seniors I’d met the day I arrived in the tiny bayou town. I’d thought when I came to Louisiana to hide from the arms dealer who had placed a price on my head that my biggest fear was being bored to death. Instead, the merry seniors and I had been chased by police, been stalked by a killer, killed the stalker, and solved a five-year-old murder. And I’d only been in town five days. She disconnected the call before I could ask for any details, and I rushed into the bathroom to wash my face and throw on clothes. As I pulled on jeans and a T-shirt, I hoped nothing had happened to implicate Marie in her husband’s murder. I’d thought she was safe after everything that had gone down the day before, but things in Sinful, Louisiana, had a way of shifting beneath you. I ran downstairs at the same time Gertie’s ancient Cadillac pulled up in my driveway. I unlocked and opened the door, then hurried into the kitchen to put on coffee. Conversations with Gertie and Ida Belle weren’t good without something to drink. Given the strain in Gertie’s voice, I thought whiskey might be a better option, but as it was only seven a.m. it was probably too early for good manners to take me straight to the bottle. But I could always play that one by ear. Ida Belle, the leader of the Sinful Ladies Society—a group referred to by Sinful citizens as The Geritol Mafia—was the first to enter the kitchen, and she did not look happy. But then, if I’d had that mass of rollers in my hair and had been prompted out of my house in my bathrobe, I probably wouldn’t have looked happy either. Gertie trailed behind, her expression one of exasperation and worry. I figured the exasperation was due to listening to Ida Belle complain the entire two-block drive to my house. Ida Belle glanced at the empty coffeepot and sighed, then slumped into a chair at the breakfast table. “I was busy waxing my car,” Ida Belle grumbled. I reached for coffee mugs. By the time they finished this age-old argument, the coffee should be ready. And I wasn’t about to step into the middle of that fight. I had personal feelings about Ida Belle’s car, and none of them were polite enough for seven a.m. I froze and stared. For the first time since I’d met her, Gertie ran out of words. I remained still and silent. Ida Belle was a crack shot and I couldn’t be certain she wasn’t packing, even in a bathrobe. Change the subject. Good choice. “The GWs met this morning at the crack of dawn,” Gertie said. “Probably not,” Ida Belle said. “The GWs are a local women’s group,” Gertie said. 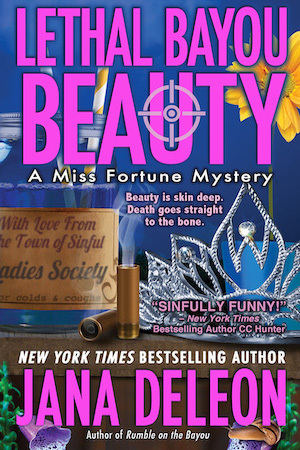 “Doesn’t Sinful already have enough trouble with the Sinful Ladies Society?” I asked. The SLS, led by Ida Belle, had been covertly running the town since the sixties. “Ah.” I was starting to get the picture. Only old maids and women who’d been widowed for over five years could apply for membership in the SLS. They had a firm belief that the close proximity of men clouded logical thinking. I tended to agree. “So what does GW stand for?” I asked. Ida Belle rolled her eyes. “I call them Got No Lives,” Ida Belle interjected. Since I’d discovered that Ida Belle and Gertie had been covert operatives during the Vietnam Conflict, it opened up all sorts of options that I normally wouldn’t consider from your average senior citizen. They’d “made” me shortly after my arrival in Sinful, recognizing my military training, and had dedicated themselves to helping me maintain my cover. Unfortunately, they also expected me to take part in their spy-versus-spy shenanigans. “Who’s Beatrice Paulson?” I asked. “I’m going to have to bring tennis shoes to church the entire time I’m here, aren’t I?” I asked. I sighed. “Let me guess—having more than one main event is against the law?” Sinful had rewritten the book on absurd legalities. I frowned. The name sounded familiar and given that I’d been here less than a week and only knew a handful of people, that seemed odd. Then it clicked and I sucked in a breath. I sucked in a breath. Holy crap! This undercover situation was the gift that kept right on giving. Right now, it was giving me an ulcer. When CIA Director Morrow had informed me that I had a million-dollar price on my head, and a leak at the CIA had blown my cover, he’d thought my posing as his librarian/ex-beauty queen niece, Sandy-Sue, was the perfect solution. Sandy-Sue had been scheduled for a summerlong visit to small-town Louisiana in order to settle up her great-aunt Marge’s estate, but the real Sandy-Sue was jet-setting in Europe while I attempted—with limited success—to take her place in the strangest town on earth. Morrow had no idea just how many problems I’d run into in a town with less population than the high-rise I lived in back in DC. “This is not good,” Ida Belle repeated. Ida Belle raised her eyebrows. “You have more ammunition than the Israeli government,” Gertie protested. I took a big drink of coffee. I wasn’t nearly as confident as Gertie and Ida Belle, but I had to give it a try. It seemed the only options were to start at the beginning with Genesis or end it all with Revelations.